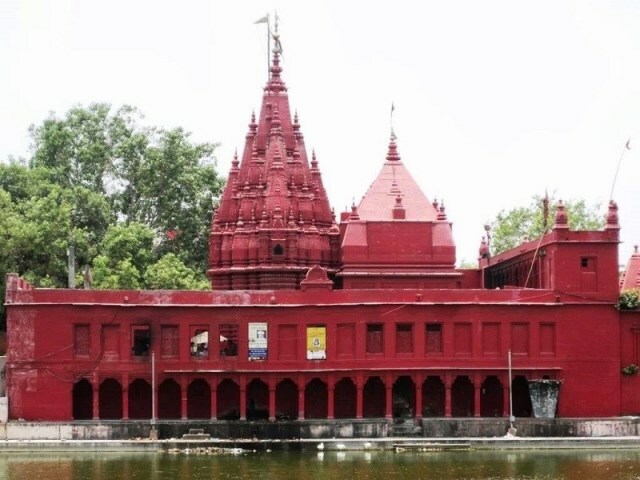 Located alongside the Durga Ghat along the banks of the Ganges River, the Durga Temple rests on a four-sided reservoir with stone stairs along all its sides and four watch pillars on all of its corners. The 18th century Durga Temple is considered to be one of the most prominent temples in Varanasi. A model of Nagara or North Indian style of architecture, the temple is stained in red and ochre and is superimposed with a multi-leveled spire called shikhara. Surrounded by foliage, the temple rests on a square shaped foundation bounded by a quadrangle campus. The stone carvings and ornamental scrawls on its walls also accentuate its square shape. However, this recurring form is not a mere coincidence. Rather, it is a symbolism of the earth and the four cardinal directions which bind and define it. It has also been depicted to signify the four major seasons: winter, spring, summer, autumn or the four prime elements: fire, earth, air, water. Mythology reveals the image of Durga as a female, clad in red, riding a tiger and fully armed with Shiva’s trident, Vishnu’s discus and a sword. This mystical statue of Durga found at the temple, according to legends, miraculously presented itself and was not made by man. It is stated in the Puranas, a compilation of ancient Hindu Texts, that even after the she saved the other Gods, the heavens, and the earth from the demon Mahishasura, the Goddess Durga still remained and kept this place safe for centuries and guarded the Varanasi city from the South. Although the Durga Temple’s architecture, mythology and history are already immensely captivating, one cannot overlook the extraordinary presence of thousands of monkeys in this sacred place. The Langur is the biggest of these and is believed to be the form of God Hanuman or Bajrang Bali, the god of power and strength. These adorable creatures and sometimes misfits, are extremely treasured by the people both locals and tourists alike. Being situated in Varanasi City, which is considered to be the cultural capital of India, a visit to the Varanasi Durga Temple will allow tourists to experience the authenticity and diversity of its culture through its people and its various traditions. These include first-hand encounters with material written in Sanskrit which is the most ancient language of the world, enjoyment of captivating music and dances, awareness of the astrological interpretations of world events, immersing oneself in philosophy, spiritualism and even yoga, and attending the fairs and festivals which are celebrated with much gaiety throughout the year. Every figure, choice of color, detail of construction and the profoundness of the meanings and symbolisms will truly provide an enchanting experience of the different facets of Indian culture. Add to that the antiquity of the temple and the mystical stories about the Varanasi Durga Temple, a visit to the sacred place will truly be an amazing and unforgettable experience.